For instant glamour in a room, add a little sheen—or a lot. 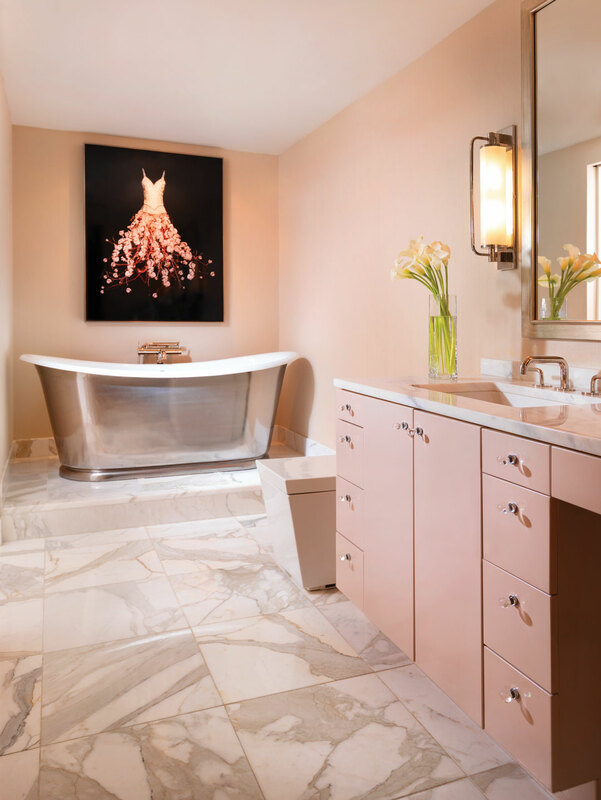 When interior designer William Peace of Peace Design was tasked with updating this circa-1992 condo at the Four Seasons, he layered glossy pinks and warm silver tones in the homeowner’s master bathroom for an ultra-feminine, Hollywood-style result. The mixed-media painting A Softer Shade of Pale by Todd Murphy sets a tone of femininity and sophistication for the room, says Peace, who positioned it above the bathtub, itself elevated on a platform. Lacquered cabinetry wears Ralph Lauren’s “Atlantic Winter” in a high gloss. Waterworks glass knobs inject a dose of glam. Kohler’s “Numi” water closet is streamlined and modern—and high-tech, with features like heat and motion activation. The burnished finish on the Waterworks tub dazzles like a piece of jewelry. For a seamless and timeless look, designer William Peace chose Calacatta Gold Extra VS marble for both the countertops and the flooring. “We used the marble in the bathroom, dressing room, and even other areas of the house,” he says.